Governors of Wu Jieh Yee Charitable Foundation Ms Tansy Lau (middle) and Mr Jason Wu(right) present a cheque of HK$15 million to the OUHK President Prof. Yuk-Shan Wong. 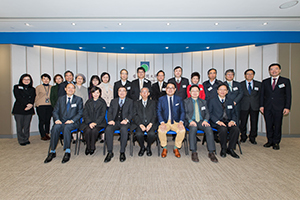 Group photo of Secretary of Wu Jieh Yee Charitable Foundation Dr Philip Wu Po-him (fourth from left, front row), Directors of the Foundation Ms Tansy Lau (second from left, front row) and Mr Jason Wu (third from right, front row), and Principal Officers of the OUHK. The Open University of Hong Kong (OUHK) received a donation of HK$15 million from Wu Jieh Yee Charitable Foundation (Foundation) to support the development of its new Jockey Club Institute of Healthcare. At a cheque presentation ceremony held today (24 January), President of the OUHK Prof. Yuk-Shan Wong expressed his sincere gratitude to the Foundation for its generous contribution in supporting the University to expand its campus and enhance its teaching and learning environment. 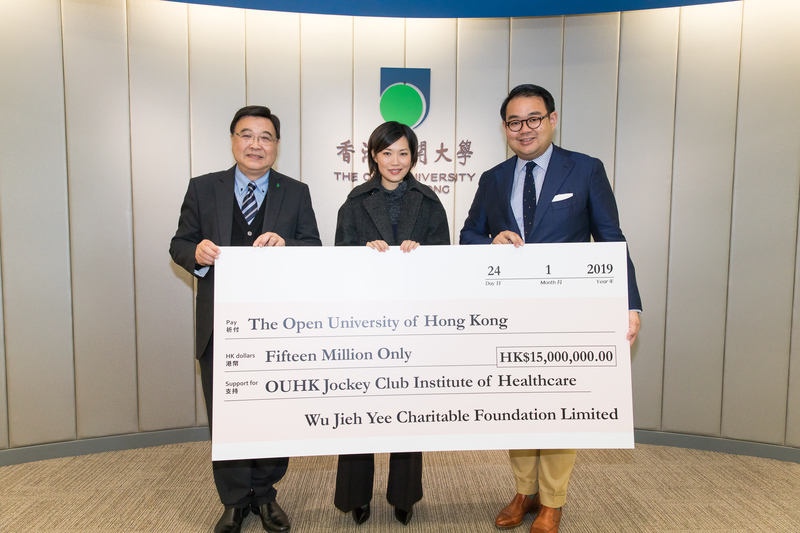 The donation received will be used to fund the construction of the OUHK Jockey Club Institute of Healthcare, which will be home to a suite of academic programmes that aims to nurture the next generation of healthcare professionals to address community needs. Wu Jieh Yee Charitable Foundation has been a staunch supporter of local higher education. It has been rendering help to the OUHK since 1994, enabling the University to expand and upgrade its campus facilities, improve its infrastructure and promote academic exchange. Dr Philip Wu Po-him, Secretary of the Foundation, served on the OUHK Council from 1992 to 2016 and was the Council Chairman from 2003 to 2004. He is also an ardent supporter of the OUHK. In addition to providing valuable advice and guidance to the OUHK, Dr Wu has also made personal donations in support of the University’s development. Dr Wu was conferred Doctor of Business Administration honoris causa by the OUHK in 1999. In the face of challenges brought by an aging population and the growing pressure on healthcare services, the OUHK has embarked on a HK$850-million campus development project on Sheung Shing Street, Ho Man Tin in 2017. This new addition to the OUHK campus will significantly improve the learning and teaching environment of the University, and nurture more professionals to cater to the future healthcare needs of society. It is expected that about 2,800 students will be benefited from the new learning facility every year upon its completion in 2020. Please visit http://ioh.ouhk.edu.hk/ to learn more about the Jockey Club Institute of Healthcare.